RoadLazer RoadPak™ HD Striping System is suitable for airports and DOT striping jobs. The system is offered in multiple configurations for individual requirements and is enhanced with control capabilities such as rear seat with steerable carriage, precision joystick controller and variable speed adjustment options. The unit’s controller features built-in patterns and independent toggle switch control. RoadPak™ HD Striping System allows user to stripe with up to five guns. MINNEAPOLIS--(BUSINESS WIRE)-- Graco Inc. (NYSE:GGG), a leading manufacturer of fluid handling equipment, is proud to introduce the RoadLazer RoadPak™ HD high-output truck-mounted striping system. The most advanced striping solution in its class, the new RoadPak HD system includes new technology and product enhancements for larger projects that demand precise control and high output. Built on the success of the original RoadPak system, the RoadPak HD features revolutionary new control technologies. The new rear seat with steerable carriage provides the ultimate control for operators when paired with the precision joystick controller and variable speed adjustment features. For additional control, the new advanced controller provides built-in patterns and independent toggle switch controls for up to five guns. In addition to providing superior control, the new RoadPak HD system helps contractors improve their overall production efficiency. With the capability to stripe with five guns or more, the RoadPak HD system can double existing production rates – helping contractors finish jobs faster. Graco has also upgraded the system to include a high-capacity pressurized bead tank that holds three times the capacity of its predecessor. 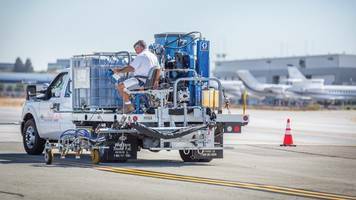 “With double the output and more advanced controls, the new RoadPak HD is an ideal system for airports and large DOT striping jobs,” says Mike Vangstad, Global Product Marketing Manager for Pavement Equipment at Graco. The RoadLazer RoadPak HD system is now available in multiple configurations to suit individual contractor needs. To learn more about the RoadPak HD system and other line striping equipment, visit www.graco.com/RoadPakHD.